Premium 400D or 600D polyurethane-coated polyester includes – UV protected, fire-rated & water-resistant. 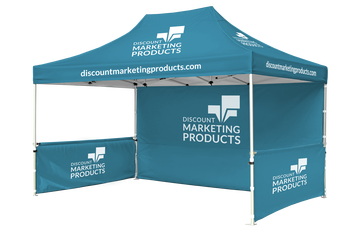 Vibrant full-color dye sublimation printing on entire canopy (4-sides peak and valance) and full-coverage on walls. PMS color match with custom-printed backgrounds. No stock colors, all fabric starts as white and is printed with a full-coverage print. Premium carry bag on wheels and stake kit included. Fabric warranty protects against fading and manufacturing defects. to negligence. Products deemed defective will be replaced or repaired at factory’s discretion.